For all but four teams, the NFL season is over. Spring Training is around the corner. We’re still in the middle of the 2018-19 NBA campaign. Yet in Cleveland, all anyone can talk about despite being three weeks removed from the 2018 Browns season finale is excitement about what lies ahead for the team in 2019. To me, there’s no more important fallout from the past year than this. In winning five of their last eight, doing so with the help of young cornerstone players and their soon-to-be head coach, the team has taken back its place as the pride of Cleveland. The city is becoming a Browns town once again. Now, sure, Cleveland has always been a Browns town in a sense. However, for reasons obvious, football hasn’t been a point of pride for locals in a long time. Thanks to a seemingly endless stream of garbage football teams being run by questionable front offices, there hasn’t been much to get excited about when it comes to supporting the Browns. It had been a while since fans enjoyed a home game with tickets which weren’t bought on a secondhand market for $2 a piece. It had been some time since TV broadcasts could pan the stands and not find someone with a paper bag over their head. 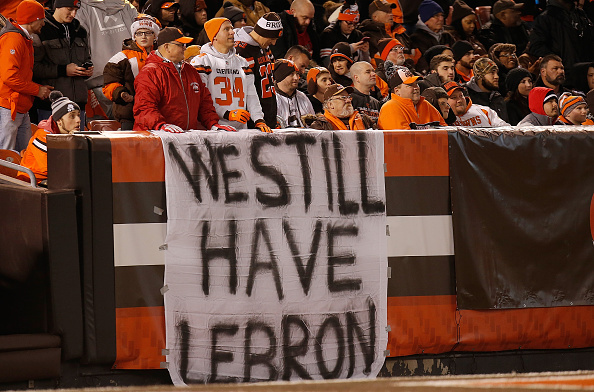 Simply put, while the Browns have always been the talk of Cleveland, said talk was rarely positive. Things appear to be changing. Most fans seem fully behind new coach Freddie Kitchens, who had no trouble winning anyone over with his “if you don’t wear brown and orange, you don’t matter” routine at his introductory press conference. Fresh off watching him set a rookie record for passing touchdowns, Browns supporters see in Baker Mayfield the franchise quarterback the team has spent decades trying to find. Thanks to players like Myles Garrett, Denzel Ward, Nick Chubb and David Njoku, fans can look at the current roster and find pieces to build around as opposed to holes as far as the eye can see. 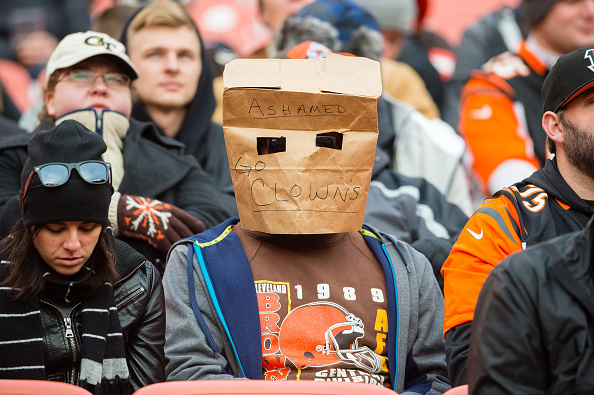 As a result, the cynicism which has long accompanied life as a Browns fan is fading away. Essentially, the city of Cleveland is back to being proud of its most popular sport as opposed to mocking it or supporting it ironically. 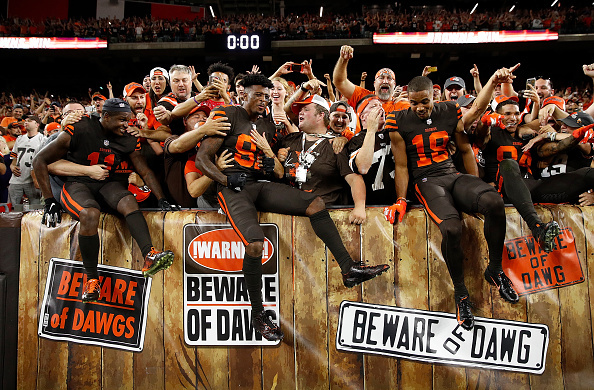 Helping matters is the fact the other local teams are starting to lose the footholds they had established while the Browns floundered over the past two decades. Though the Indians are two years removed from a World Series, they’ve been decidedly quiet this offseason, making fans anxious with their gun-shy approach to going all-in during a window of contention. The Cavaliers…well, things aren’t going too well since the latest departure of LeBron James. It’s this last bit which makes the Browns resurgence so important. James leaving for Los Angeles was supposed to set local sports back, as was the case when he fled for Miami in 2010. In the time between that year and his eventual return, the Cavs would go on to lose 26 straight games, the Browns would fail to win more than five times in a single season, while the Indians netted the only local postseason appearance – a wild card game in which they failed to score a run. While the Tribe is still expected to return to the playoffs in 2019, it’s the hope surrounding the Browns which suddenly has the city buzzing despite losing James for the second time. This isn’t to say there’s no hope for the Indians. That said, to have it with the Browns, the city’s favorite team and a franchise which hasn’t enjoyed such a concept since the 80’s, that’s an entirely different situation. Again, more often than not, the Browns were always the talk of the town. People still discussed the draft as Cavaliers playoff runs ramped up. A Week 4 match-up received as much talk on sports radio as an impending postseason series for the Indians. That said, it’s been a long time since local Browns fandom reached a fever pitch like this. Since fans have experienced the concept of expecting wins, of watching football games which will actually matter. It’s a welcome change of pace, and it’s one the city of Cleveland has been waiting to see for decades.